Speaking to the New York Times, Mr Trump said the US would only come to the aid of allies if they have "fulfilled their obligations to us". Although the White House has not responded directly to Mr Trump's comments, spokesman Josh Earnest said on Thursday the US commitment to NATO was "ironclad". He said potential enemies should not misjudge Washington's commitment to defend its NATO allies. "The president renewed that commitment just two weeks ago today when he travelled to Warsaw, Poland, to attend the NATO summit." Mr Trump's comments hit at the fundamental basis of the Atlantic alliance; that an attack on one ally is an attack on all. Under Article 5 of Nato's founding treaty, allies are bound to come to the aid of a member under attack. Mr Trump's positions will be seen by Washington's Nato partners as at best eccentric and at worst alarming. At a time of growing tensions with Moscow, the idea that the US might become an unreliable ally is a nightmare for Nato's European members. 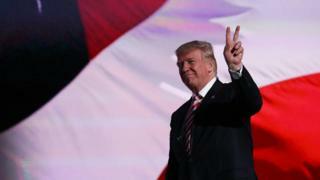 The divisive Republican candidate also said that, if elected, he would not pressure US allies over crackdowns on political opposition and civil liberties, arguing that the US had to "fix our own mess" before "lecturing" other nations. He said: "Look at what is happening in our country. How are we going to lecture when people are shooting policemen in cold blood?" "I give great credit to him for being able to turn that around," Mr Trump said of the failed coup. "Some people say that it was staged, you know that," he said. "I don't think so." "When the world sees how bad the United States is and we start talking about civil liberties, I don't think we are a very good messenger," he said. He said he would "prefer to be able to continue" existing agreements - but not if he felt allies were taking advantage of the US. Referring to what he said were US trade losses, Mr Trump said: "We are spending a fortune on military in order to lose $800bn. That doesn't sound very smart to me." He also suggested he would close US bases abroad. "If we decide we have to defend the United States, we can always deploy" from American soil, he said "and it will be a lot less expensive". Mrs Trump's speech caused embarrassment when journalists noticed that sections of the text appeared to have been copied directly from a speech given by Michelle Obama at the 2008 Democratic Convention.